Soap bars are formulated with a combination of longer carbon chain length fats (tallow, palm oil, palm stearin) and shorter carbon chain length oils (palm kernel oil, coconut oil). Common nomenclature for bar soaps is the ratio of the longer carbon chain length fat to the shorter carbon chain length oil. For example, a bar containing 80% tallow and 20% coconut oil as its soap base would be referred to as an ''80/20'' soap bar. Ratios used typically range from 90/10 to 60/40. The higher coco or palm kernel oil levels in a soap bar not only leads to a higher lathering profile  but also to a higher use-up rate due to the high portion of the shorter carbon chain length base. Regular soap bars generally contain approximately 75 to 85% soap. The remainder of the soap bar is made up of water, glycerin, salt, fragrance, and other additives that enhance its aesthetics and performance. Soap bars are frequently superfatted to ameliorate the harshness of the soap and improve the sensory profiles of the products (see the Free Fatty Acid or Superfatting sections of this chapter). Superfat levels in soaps typically range between 1 and 7%. Formulation of soap bars has become increasingly complex. As soaps have become more readily available to consumers, the demands on the product performance have increased. Consumer expectations have increased beyond basic cleaning to improved mildness, lathering, deodorant protection, antibacterial protection, and interesting product aesthetics and packaging . Bars produced with synthetic surfactants have improved lathering and rinsing profiles, especially in hard water. At higher levels of synthetic surfactants, the bars exhibit superior mildness versus regular soap. Examples of synthetic bars (syndets) on the market are Dove, Oil of Olay, and Vel. The raw materials and hence the finished product cost of incorporating synthetic surfactants is higher versus soaps. Combination bars, or combars, are designed to incorporate the most desirable properties of plain soap bars and synthetic cleansing bars (Syndets) (Fig. 3). In general, their advantages over conventional soap are superior rinsability and latherability in hard water. Examples of combars on the market include Zest and Lever 2000. Figure 3 Skin cleansing bar formulations and attributes. The benefits of conventional soap bars are good lathering, thorough cleaning, and low cost compared with bars containing synthetic surfactants (Fig. 3). Some of the shortcomings are: (1) performance dependence on water hardness conditions because of its reactions with calcium and magnesium salts in hard water causing difficulty to rinse ''soap scum,'' and (2) lack of clinical and consumer-perceived mildness benefits. Some people can experience irritation and excessive dryness, especially during periods of low temperature and humidity such as in winter. Synthetic cleansing bars (syndets) generally contain only low levels or no soap. Instead, syndets comprise synthetic surfactants (between 2080% of the total bar composition), high concentrations of emollients and conditioners, and some fillers and binders . They tend to cleanse and lather well in soft or hard water, and they are unaffected by calcium or magnesium salts which results in better rinsing properties from skin and hard surfaces. Also because of the presence of high levels of skin moisturizers and conditioners, syndets impart more skin after feel, leaving the skin feeling softer and more moisturized. While all synthetic surfactants overcome the hard-water deficiencies of soap, not all of them are suitable for use in cleansing bars because their effects on skin can be markedly different than soap. Selection criteria that one needs to follow in order to choose a synthetic surfactant for use in soap bars are quite strenuous. In addition to being mild, the surfactant must possess acceptable properties such as surface activity, physical and chemical stability, good odor and color, processability into soap bars, quick lather, and clean skin feel . Some can be too strong and irritating to the skin and can therefore leave the skin feeling dry and damaged. Common anionic synthetic surfactants used in syndets and combars include sodium cocoylisethionate, alkylglycerylether sulfonate, and alkylsulfate. Amphoteric surfactants such as cocamidolpropylbetaine or nonionic surfactants are also sometimes used at low levels. Translucent and transparent soaps incorporate high levels of solubilizers, which tend to control the crystal size and structure, thus allowing the transmittance of light through the product. Examples of solvents added to translucent and transparent soaps include glycerin, sorbitol, triethanolamine, and other sugars [20-22]. These specialty soap products frequently have altered lathering, rinsing and use-up rate characteristics because of the high level of solubilizers in the finished product. 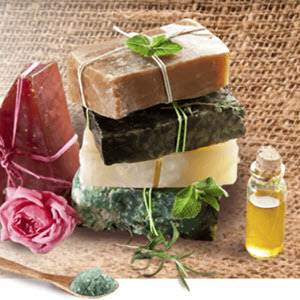 Other specialty soaps include the addition of unique aesthetics (marbleized and striated) or the addition of specialty abrasives (e.g., pumice, seaweed) and other botanical or natural ingredients.